AmyLynne I was just looking at all your bags on Ravelry... I especially like this one and the flamingo bag. Beautiful bag! My grandpa died of throat cancer, a very dear friend of mine that i called grandma just died of cancer, and many people i know have breast cancer... thank you for this pattern!! it is a lovely way to raise cancer awareness! 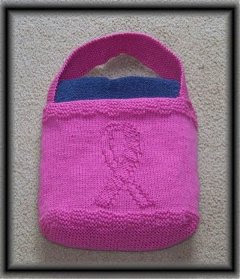 Beautiful bag, thanks for sharing the pattern and thanks for the useful information regarding the different colors for the different cancers. Awesome, g/f! This one is definitely my favorite. Smart move adding the color chart at the bottom. Now hurry with those scarves...the world needs to see them!!! My granddaughter was born with Neuroblastoma...what color would her ribbon be? Great pattern and list Thank you...You are so creative. Thanks for sharing and having a great blog too. I've just discovered your patterns, they are so cool and I love how you provide a detailed pattern rather than providing a chart. As an intermediate knitter I find charts a little overwhelming. Do you use a computer program to work out your patterns or is it all done manually? I'm making the angel cloths as presents for a special teacher, would love a dancer pattern for a special little girl's birthday. I am knitting things for my dearest friend who is recovering from breast cancer and was hoping to sell things to go directly to breast cancer in her name, I was wondering if that would be acceptable.